The former communications aide and reality-show star created more headaches for the Trump administration this weekend. Plus: Trump backs Harley boycott. Who could’ve possibly seen this coming? 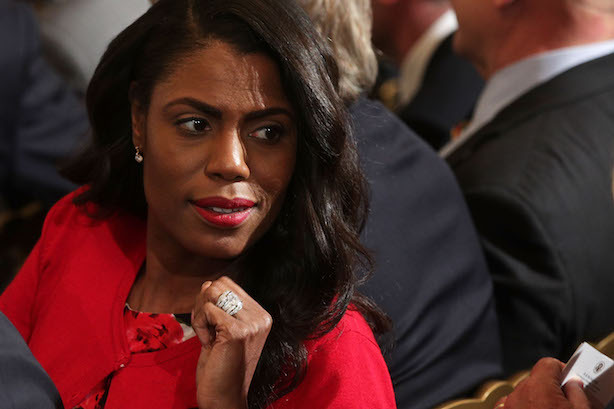 It was the weekend of Omarosa in political news, with former reality show villain and short-lived White House communications aide Omarosa Manigault-Newman saying on Meet the Press that she heard a tape of President Donald Trump using a racial slur while taping The Apprentice (NBC News). In a stunning breach of protocol, Manigault-Newman also played a tape of White House Chief of Staff John Kelly dismissing her in the White House Situation Room last December (New York Times). President Trump backed a customer boycott of Harley-Davidson in a Sunday morning tweet, again dinging the motorcycle-maker for planning to move some production overseas (CNBC). In June, the company blamed tariffs for forcing it to move production of motorcycles sold in Europe to overseas factories (Time). A top IBM executive was reportedly approached about taking WPP’s top job. The holding company interviewed Watson and cloud platform SVP David Kenny last month for Martin Sorrell’s old position. However, he’s no longer a candidate for the WPP role, according to an IBM spokesperson (Sky News). Saudi Arabia’s sovereign wealth fund is considering backing Elon Musk’s push to take Tesla private, which could prompt even more regulatory scrutiny of the move (Bloomberg). Musk’s surprise announcement is also likely to result in even more attention on how executives use social media (Reuters). Papa John’s is lowering royalties and other fees for franchisees after a significant sales drop in the second quarter, blamed on founder John Schnatter’s use of a racial slur on a conference call (Reuters). The leader of one of its largest franchise organizations just wants founder John Schnatter to go away, saying in a statement late last week that "we believe it is time for the founder to move on." (CNBC).